← Bloom Right Where You Are! And we were. You could smell us coming from the other side of the building! I imagine her face was burning, her eyes were downcast. Her heart was pounding and her mouth was dry. But her eyes were not. She is described in Luke as “the sinful woman”. What is she doing here? Get her out on the street, where she belongs. The nerve of filth like that, coming in here with us. I’m sure the whispers and murmurs were like shouts to her ears and her injured soul. Still…on she walked. How many steps did she have to take to reach Grace? Was it a few? Was He all the way across the room? As she fell before Him, she cried so many tears that she was able to wash His feet with them. She dried His feet with her hair. The Bible says that she broke her alabaster jar, a very expensive treasure (Mark says it was worth a year’s wages), and poured it on His head. As the oil flowed over His head, His mercy washed over her’s. Mercy worth more than a whole life’s wages, and she knew it. The murmurs continued. And a whole jar of perfume? Seriously, that’s a year’s worth of wages she just wasted. And now the whole room is filled with the smell! What a waste! The room was filled, all right. It was filled with the same thing that our churches and our lives are filled with today. It was filled with the battle between worship and the world. She was there to worship. She was there in obedience. She was there to seek forgiveness, though she knew she wasn’t worthy. Others were there to dine and visit. They were there to be seen and heard. While she was there, she surrendered a very precious possession. 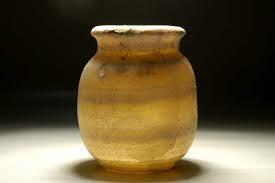 When her jar of alabaster was broken, the fragrance must have filled the room. I imagine that when she left, the fragrance clung to her hands, her hair, and her clothes for weeks and months. The fragrance probably drew the attention of those she came in contact with. It must have permeated the air that was around her. It was the fragrance of her worship. When I worship the Lord, does the fragrance fill the room? Or am I like the Pharisees, too concerned with the actions and labels of others to focus on my worship? When I’m around others, does the fragrance of my worship follow me, or does it quickly fade into the background and noise of the world? My prayer is to be like her. When my praise and my worship require a sacrifice, I want to offer it without hesitation. I want my worship to be a fragrant offering to the Lord, not the meaningless act of a Pharisee. Even when I know I am undeserving, when I know others might belittle me or question me, I want the worship of my Father to be my number one goal. And when I go out into the world, I pray that the fragrance of my worship doesn’t fade. I pray that it clings to me, and that others will sense the Lord in me. Like my sweet child at school said, I want to take my “arom-y” with me! Here’s a song from awhile back. I wrote and recorded it about fifteen years ago. It was and still is the prayer of my heart. Take a listen to The Fragrance of My Worship. Sharing this week with Holley Gerth’s Coffee For Your Heart and faithalongtheway’s Saturday Soiree. This entry was posted in Devotionals and tagged alabaster jar, forgivenesx, Jesus, worship. Bookmark the permalink. My favorite of your songs!! I remember when you wrote this and played it for me over the phone! Amanda! Remember when we sang it in choir? Love you! Yes I remember! It is such a beautiful song and it sounded great with the choir singing too! This is wonderful! What a great hand sanitizer story- I loved it!- Your thoughts and your song too! Beautiful! Thank you for blessing me today! I love this! I too want to be more like the woman who knew she was a sinner.